This weekend we gathered at my friend Dougal's house to make tomato sauce. We do this every year and it's a good chance to catch up, relax, chew the fat and make some delicious sauce. This year Dougal asked me to "instead of BBQ meat, bring something child nommable." Year of Pie to the rescue! 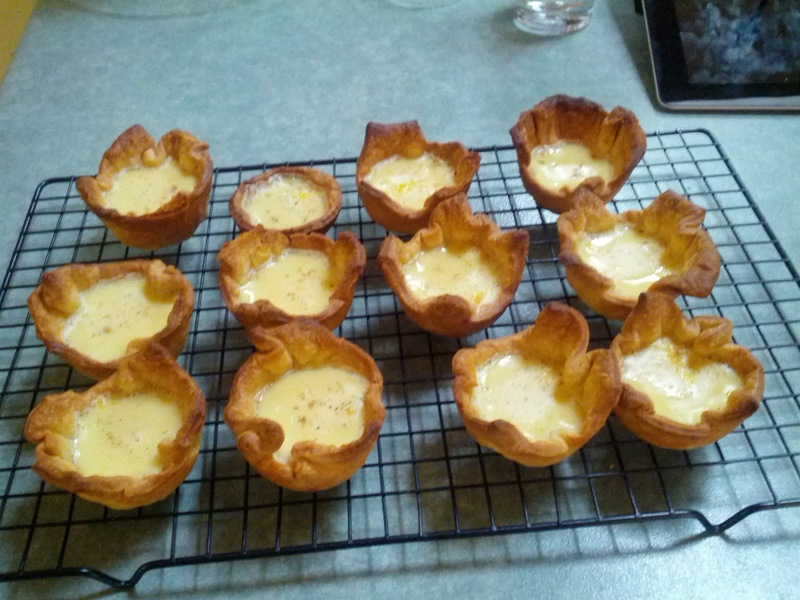 I decided to make custard tarts, something I've always enjoyed. I got this recipe by Michelle Southan from Fresh Living (April 2004, Page 49) via taste.com.au. It's designed to make six 8cm tarts but I needed to make more so I tried to adapt it to make 12 mini tarts using a cupcake tin. This mostly worked. You can see from the photo that I was largely experimenting with how to get the pastry into the cups. Process flour, icing sugar mixture and butter, in a food processor until fine crumbs form. Empty into a chilled bowl and make a well in the center. Add 2-3 tbs water and mix with hands gently and quickly until soft dough forms. Roll into a ball, divide into 6 portions. Roll out each portion to 3-4mm thick, to line six 3cm deep, 8cm (base measurement) round fluted tart tins with removable bases. Put on a baking tray and refrigerate for 15 minutes. Preheat oven to 200°C. Line the pastry cases with baking paper and fill with rice. Bake for 15 minutes. Remove paper and rice. Bake for 15 minutes. Reduce oven temperature to 180°C. Combine eggs, vanilla essence, caster sugar and milk. Pour into cases and sprinkle with ground nutmeg. Bake for 20-25 minutes or until just set. I made twelve mini tarts with this recipe which kinda worked. I didn't make the tart case sides high enough (partly because they weren't round enough) which meant there wasn't enough custard in a lot of the tarts. I should've baked the shells for at least 10 minutes less. This was also my first week using the food processor to mix the butter and flour for the shortcrust pastry. This was much easier and gave a more consistent result but I'll be trying the manual method again next time - I'd like to think I've got that nailed before I fall back on the mixer more frequently. I'm definitely making this one again!